Gregory Hancock Dance Theatre will open its 21stPerformance Season with the return of the gothic drama THE CASKET GIRLS. Originally premiered in 2009 as one act, this modern vampire ballet features original music composed by recording artist Cory Gabel of Simsbury, Connecticut, and choreography by award winning Artistic Director Gregory Glade Hancock of Carmel, Indiana. After nine years, these two artists have reunited to complete this full-length theatrical collaboration. Based on the lore of the casket girls who arrived in New Orleans from France in 1729 dragging their trousseaus, Act I will wind you through the mysterious happenings of the Filles a la Cassette, their residency at the Old Ursuline Convent on Chartres Street, and the suspicious activities surrounding them. 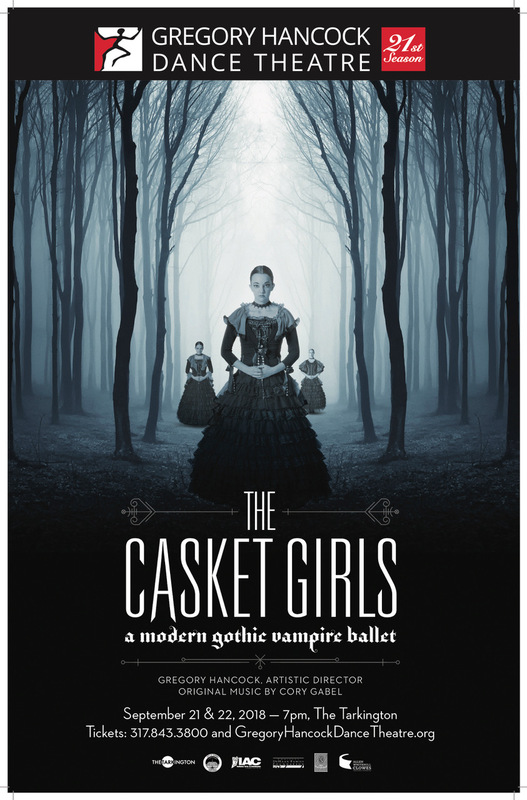 The premiere of the full-length production of THE CASKET GIRLS will move the story from the legends of yesteryear in Act I to current day New Orleans with vampires, voodoo and mystery in Act II. This production will bring to life this dark and obscure story and leave you with chills. “As with many of my works, time and place are often vaguely indicated in order to make the theatrical dance appealing on many different levels and to keep my work relevant and current,” says Mr. Hancock. Audiences will find this little-known story interesting and engaging. “Full-length story productions always draw in audiences. Storytelling in the theatre gives audiences connection as well as insight into the artistic process of the creators. The cast can play roles and create characters completely different from their own personalities,” says Mr. Hancock. Reuniting on this theatrical dance and commissioned music project after nine years was meant to be. “The original collaboration for Act I of THE CASKET GIRLS was a great experience,” comments Mr. Hancock. “Cory was wonderful to work with and we both seemed to always be in sync with ideas and the direction for the piece. We had originally talked about expanding it to a full-length piece, so it is nice to finally have this opportunity,” he adds. A fan of contemporary dance, Mr. Gabel notes, “I think we both saw the first production as Act 1 from the beginning, knowing that there was much more of a story to be told. To return to the characters and the storyline was always a draw for me. In the years since, I’ve collaborated on several other dance productions, many of which I’m very proud, but THE CASKET GIRLS has remained my favorite – the story, Gregory’s choreography and staging, and the music is about as ‘Cory Gabel’ as it gets. Not every collaborator understands my particular mix of orchestra, ethereal voices and industrial rock!” The original THE CASKET GIRLS soundtrack is currently available on iTunes, Spotify and other digital download or streaming platforms. Music from Act II will be available in the near future. “It is rather rare to experience this kind of collaboration in the current dance/music environment. I think audiences will really enjoyTHE CASKET GIRLS. They will get drawn into this thrilling drama and go on an incredible journey with the cast,” says Mr. Hancock.